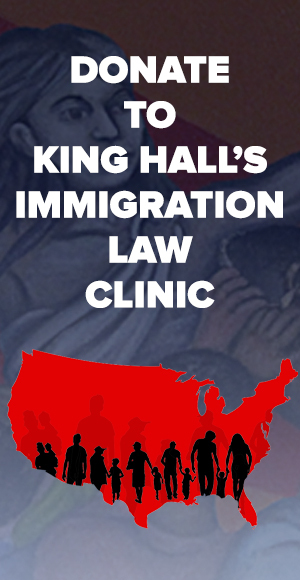 As the controversy over separations of migrant families at the U.S.-Mexico border unfolded last week, King Hall’s immigration experts entered the national spotlight. Professor Holly Cooper, Co-Director of the Immigration Law Clinic, spoke to dozens of media outlets, including CNN, Politico, Vice News and the Huffington Post, about the separations, migrant children’s rights and President Donald Trump’s executive order – issued June 20 after public outcry about the separations – reversing the policy. Dean Kevin R. Johnson weighed in on the separations issue in an op-ed for The Conversation, then reacted to Trump’s executive order in an NBCNews op-ed. Professor Rose Cuison Villazor was quoted, along with Cooper, in a San Francisco Chronicle analysis of Trump’s order, and Villazor also commented for Mother Jones. Associate Vice Chancellor for Academic Diversity and Professor of Law Raquel Aldana and other UC Davis faculty members also spoke to the media about the family separations and the executive order. Pursuant to the executive order, the Department of Justice on June 21 asked a U.S. District Court judge in Los Angeles to modify the Flores agreement, a 1997 court settlement prohibiting the federal government from keeping children in immigration detention centers for more than 20 days. The DOJ wants leeway to hold the children, with their parents, for longer. The Flores settlement already was prominent in the news because of legal filings by a team that includes Cooper and Professor Carter White, supervising attorney of King Hall’s Civil Rights Clinic. In April, that team filed a motion in U.S. District Court accusing the government of inappropriately detaining migrant children in restrictive detention centers without fair process, unlawfully medicating children without parental authorization, and failing to promptly release children to family members in the United States. King Hall students Mayra D. Sandoval, Gladys Pimentel Hernandez and Christian Hatchett played key roles in filing the motion, having interviewed juvenile detainees over the course of several months. A hearing was set for June 29, but it might be postponed, Cooper said. Reveal (the Center for Investigative Reporting) cited the April court filings in a June 20 investigative piece about children being forcibly injected with drugs at Shiloh Treatment Center, a detention facility near Houston. Several other national and international outlets reported on the story, including Reuters, the Daily Beast and the Huffington Post, which interviewed Cooper. Dean Johnson’s work has been cited by the federal district court in recent proceedings tied to migrant family separations. Earlier in June, U.S. District Court Judge Dana Sabraw cited Johnson’s analysis of asylum law, from Johnson’s book Understanding Immigration Law, 2d. Ed (2015), in Ms. L., ; et al. v. ICE, in which two women seeking asylum say they were separated from their children at the U.S.-Mexico border despite there being no determination they were unfit. Sabraw refused to dismiss the women’s case.